I've had a rotten week. One that's been hanging over me for a while. It's been full of appointments (including two very lengthy ones in the dentist's chair). I always do that - engineer all my grotty things to fall within one week so that when the dreaded time comes, I hold my breath, put my head down and plough through it, knowing that it will soon be over. Anyway, feeling just a touch lightheaded with relief, I thought it would be fun to put a scenario to you. 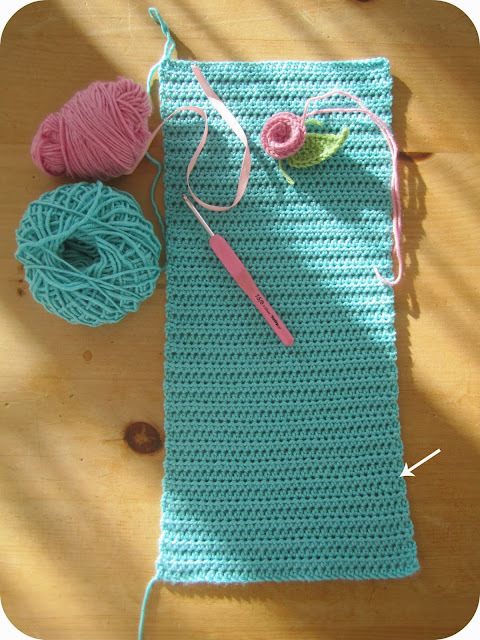 You're crocheting (or knitting) yourself a scarf. You've got about fifty perfectly executed rows under your belt when you suddenly notice that you've dropped a stitch, (crocheted through one loop instead of two) near the very beginning. Would you not give it a second thought? Would it bug you so much that you'd just have to unravel? Would you bury it in the depths of your 'WIP' basket, promising yourself that you will deal with it 'some other time'? I would just love to know what your reaction would be and how you'd deal with it, if at all. Edited to add : Bless you all, you're just too lovely for words! I did a quick straw poll in my own household - two of us wouldn't bother at all with the mistake but the other two struggled! I'm a perfectionist so, yes, it did bug me enormously but I didn't unravel it. Nearly but not quite. I had a strict word with myself and have decided to embrace the imperfection as a fitting reflection on a pants week. If it had been any more noticeable then it would have been for the chop!!! Ah the age old question ... to rip back or not? I would only rip back if it was obviously noticeable (of which yours is not) I have been known to rip back to fix a mistake, plough on, new mistake, rip back again, third time forward another mistake noticed ... this would be the time to chuck it into the depths of the work basket hehe. if it takes a fellow crocheter longer than 10 seconds to locate to error then I would leave it. Life is too short. Stick a flower on the offender! Ooooh that's a tricky one - wouldn't have noticed it if it hadn't been pointed out but I think from the fact that's its niggling you now probably best to undo and go back as you'll always know its there otherwise. Either that or make a few more similar mistakes so it becomes part of the pattern ?!? Hi Heather, I think it's barely noticeable....and that's after you have pointed it out. I would just carry on and if it makes you feel better you could do one increase in the corresponding place at the other end so it looks even at both ends. definitely carry on - I usually pull it out and then regret it the minute I've done it! I'm coming in at the tail end and see you have already made your decision Heather, well done! I love the colours and the little flower is gorgeous, very gentle shades. So sorry you've had such an awful week but hip-horray it's all over and done with now; I dislike (intensely) being at the mercy of the dentist and have lots of bad memories of such times as, no doubt, many of us do! Dentist appointments, yuck, I'm glad that is over for you. As for the crochet...hmmm, I'm a perfectionist but if the mistake wasn't too noticeable I would probably ignore it. If it was a work for someone I would probably have started again. Love the colour of your scarf. Leave it, no one will ever know. In truth you can hardly see it but I know it would bug the life out of me! b - make a feature out of it and disguise it with a little group of smaller flowers or perhaps a little flower shape made out of tiny buttons. then do another group of them further up, so it does look like a proper pattern! Ha ha, that's what I do too. Grit my teeth and rush through it all! I seem to have a few weeks like that lately but I'm hoping this one will be the last. Anyway, I can certainly understand your frustration on spotting a mistake after so much work. To be honest, given that it's so far back and hard to see I think I'd have to leave it be too. All part of life's rich tapestry I would say and try to forget! The mistake is not noticeable at all !! But yes, when that happens it does bother me and I guess that whenever that's happened to me, I've had to unravel it.... That's one of the reasons I find knitting much harder because when I make mistakes (which is very often) the process of unravelling it is sooo painful. I am quite in love with the colours of your scarf...it is going to be stunning! I would never have noticed the wrong stitch at all, I would keep going with it too. I'm so glad you didnt unravel all your hard work - to me, part of the beauty and specialness of handmade things is the occasional slight imperfection don't you think? Keeps it real? ;0 But I do know what you mean, it can niggle away at you and sometimes drastic measures are called for, but your tiny mistake is not at all noticeable. The colour of your scarf is gorgeous! I unraveled a cowl because the 20€ suri yarn had a chunk & knitted weirdly. After so many rows unraveled I knitted it again & it was the very same. I pulled & pulled for nothing.